Misr Fi Afrikia min Abdel-Nasser to El-Sisi (Egypt in Africa: From Nasser to El-Sisi), by: Abdel-Moati Abu-Zeid, Ramadan Korani, Samar Ibrahim, (Cairo: SIC), 2019. 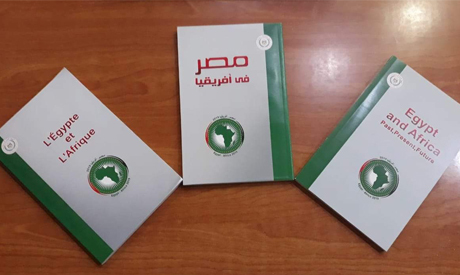 Egypt’s State Information Service (SIC) has a released a new book in several languages including Arabic, English and French as Egypt prepares to chair the Africa Union in 2019. An abridged version of the book, titled Egypt in Africa: From Nasser to El-Sisi, will be translated into a number of African languages. The book aims to educate the Egyptian people about Africa as well as explain Egypt's policies and vision regarding the continent. The book also takes an in-depth look at Egypt's policies in Africa from 1952 until now. The book was authored by Abdel-Moati Abu-Zeid, the head of the foreign media department at the SIC, Ramadan Korani, the managing editor of the African Horizons periodical, and Samar Ibrahim, the managing editor of the Asian Horizons periodical. Through its eight chapters, the book covers all the dimensions of Egyptian-African relations, including security, economy, culture, politics and water issues, as well as highlights Egypt’s role in regional and continental bodies in Africa. The book is currently being distributed to Egyptian embassies in Africa as well as to foreign correspondents and Egyptian diplomatic missions all over the world. It is also being sent to the Egyptian parliament and research and media institutions.